The Goo-Goo Buggy is Baby Mario's kart in Mario Kart: Double Dash!!. It resembles a blue baby buggy with a Smiley Flower emblem on each side. Its name comes from the onomatopoeia a baby makes. 1.1 Mario Kart: Double Dash!! 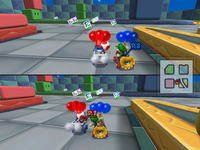 The Goo-Goo Buggy is a lightweight kart and is set as a default when the game is first started. It has low speed, but perfect acceleration and good steer. However, this kart is light, and therefore is easily knocked around by heavier karts. 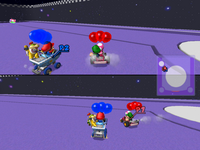 The Goo-Goo Buggy has the same speed and acceleration as the Toadette Kart in terms of stars, and the two karts are also tied in weight, meaning that they can't push each other around. However, the two karts are easily pushed around by the Para-Wing (another kart with the same in-game speed and acceleration, but is slightly heavier). In terms of actual stats, the Goo-Goo Buggy is tied alongside the Toadette Kart and Para-Wing for having the lowest top speed in the game. Also, while its acceleration rating may be five star, the Goo-Goo Buggy actually has less acceleration than the Para-Wing, while being tied with the Toadette Kart. The Goo-Goo Buggy appears as an Advanced-class Attack-type spirit in Super Smash Bros. Ultimate, where it features the artwork of Baby Mario and Baby Luigi driving on it. It is unlocked as a reward for completing the challenge of KO-ing three characters in less than a minute in one match. When characters equip the spirit, it reduces their weight. French Téti Mobile From "tétine" (pacifier) and "automobile"
The Goo-Goo Buggy is not pushing back the Bullet Blaster, which would be the case in GP races. Another example of the incorrect weight of the Kart in Battle Mode. In Battle Mode, this kart's weight is tied with the Bullet Blaster's weight. However, it is heavier than the Bullet Blaster in any other game mode. 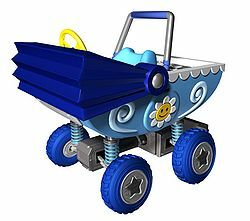 Similarly, the Toadette Kart in Battle Mode is heavier than this kart, but they have the same weight in other game modes. This page was last edited on February 23, 2019, at 19:11.